It’s time to NaNoWriMo! Or if you’re not participating, you can use this worksheet break down your writing goals, and set up your own milestones. You can even use this worksheet as a retrospective. How about filling it in at New Year’s? What milestones did you hit this year? Where were you at this time last year, and how far have you travelled? I’m sure you can think of lots more ideas! 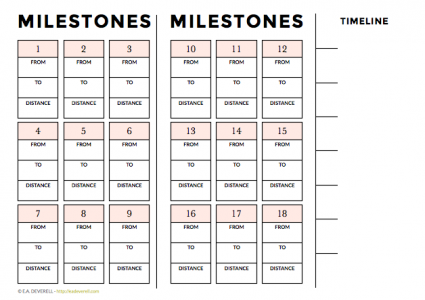 Use one worksheet for many different types of milestones, or map out a single trajectory – it’s up to you. P.S. You can list the dates when you reached each milestone on the timeline. Need help with your novel? Take an online creative writing course – starting NOW.